I seem to write about chumros every Pesach because every Pesach brings with it additonal insights into this subject. Chumros on Pesach are a prominent feature of the Pesach landscape and partake of many related and important ideas in spirituality and Avodas Hashem. Why is even a tiny piece of Chametz forbidden on Pesach? Radvaz (Rabbi David ben Zimra, 1479-1573) askes this question in She'elot uTeshuvot Radvaz, 3:546 (977). After finding that there is no other halacha that makes quite such stringent demands, he concludes that this is because chametz symbolizes the yetzer hara (evil inclination). One place where this idea is expressed is in Brochos 17a, where it says that when Rabbi Alexandari finished saying the amidah, he would add a tefillah: "Master of the Universe, You know full well that it is our desire to act according to Your will; but what prevents us from doing so? The se’or in the dough..."
However, Chido in Simchas Haregel extends this idea from searching for chometz to Pesach in general. He writes(Machazik Bracha 457): "It is well known that every person accepts on himself stringencies, adding fences and barriers because of the severity of the prohibition of chomets, as Radvaz explained in a teshuva". He adds that there is no prohibiton of appearing super-punctillious but it should be done in private and the rabbi who rules for others should not follow only the letter of the law. The Minchas Eleizer writes similarly in Machazil Bracha 457 that on other ares of halcha "the power to permit is preferable" but our tradition regarding chometz is to rule according to strict opinons. He attributes this approach "our rabbis, ZTZ'L". This, unlike Chido, he directs even the rabbis to rule strictly, even for others. This approach finds its expression in the the Chabad saying, "Pesach is andersh(different)" and in the practice of Ismach Moshe to accept any possible chumra found is seforim, as documentd in Tehila L'Dovid, a sefer written by his grandson. This remains the prevailing approach in Satmar as documented in the article in the Pesach issue of Mishpacha about the Williamsburg Matza bakery, the only bakery in the world in which, based on R. Yoel's directive, every possible chumra is being kept. The Mei HaShiloach quotes Reb Bunim MiParshischa who said that all the stringencies that the Jewish People adopt on Pesach are adornments to holiness, and this is alluded to in the verse that states (Shir HaShirim 1:!0) tzavareich bacharuzim, your neck with necklaces. This means that every limb of a person’s body has a corresponding ornament or garment, whereas the neck can be adorned with an ornament that is not unique to the neck. A precious stone is not designed to clothe someone. Rather, it is intended to be suspended from a person’s neck. Similarly, the stringencies that have been adopted by the Jewish People on Pesach is due to the fact that the neck is the vehicle through which the food enters, and it is specifically regarding food matters that all the stringencies on Pesach apply. Here is how I understand this concept. Generally, a chumra is praiseworthy thing and an expression of loving G-d, except that a person should not take on stringencies that are far above his or her current level of observance. Doing so exposes his other deficiencies and represents Kefitsas Hamadreigos which is not the right way in serving Hashem. However on Pesach even chumros that are far above the observance level are fully legitimate. Pesach is the time of mortal combat with Yetser Hara and in a fight to the last, any weapon is acceptable. It is no dishonor to a warrior in the midst of the battle to slay his enemy with a tree trunk, should a sword not be available. Similalry, Pesach is a "time-out" during which the usual considerations in Derech Hoavoda do not apply. I always thought that the statement of Ramo in in Orach Chaim 443:6 contradicts this approach. Ramo writes that those who scour and wash the walls before Pesach have what to rely on and shold not be ridiculed. Mishan Berura points out that they rely on a Yerushalmi. Doesn't this indicate that chumros even on Pesach must have something on which to rely, something at least of the gravity of Yerushalmi? "The Rebbe was also very much against all the special stringencies that are observed on Pesach. Many people went so far in observing many fine points of custom that they were literally depressed by the holiday. He spoke about this at length. One of his followers once asked the Rebbe exactly how to act with regard to an ultra-stringent observance. The Rebbe made a joke of it. The Rebbe spoke about this quite often. He said that these ultra-strict practices are nothing more than confused foolishness. He told us that he had also been caught up in this and would waste much time thinking up all sorts of unnecessary restrictions. Once he worried about the drinking water used during Pesach. He was afraid that a small amount of leaven might have fallen into the well from which they drew water. The only alternative would be to prepare water in advance for the entire Pesach week, as some people do. But this was also not good enough, for the water had to be carefully safeguarded from leaven from the day before Pesach, and this was very difficult." Here is how the RCA put it in a statement issued in 1997. " The promulgation of stringencies were condemned because they add additional financial burdens on the Jewish consumer. Unnecessary stringencies are divisive........they foster an atmosphere of cynicism that no standards are ever good enough." However, there is also a middle approach, one that says that some chumros are good and some are bad.The good ones keep you out of trouble because they bring with them zechus avos. Inyan this year, the magazine of Hamodia, contains an interesting interview with the Squarer Rebbe. In it he quotes this Ramo as an indication that chumros IN GENERAL, not only on Pesach, must have something on which to rely. "This is how the Rav of Ostrow interpreted this Ramo. This something should be a received tradition from our forefathers. "This is a gevaldige message", the Rebber enthuses. "If one relies on his ancestros, it is their responsibility to ensure that he does not stumble. On the other hand, if their way does not find favor in his eyes,then it is as if he has forged a new path, and in that case ancestors bear no responsibility and one is dependent on his own zchyos". He goes on to share a story of a certain machmir who would not eat of the Magid of Chernobyl's shirayim because of the minhag of not to "mish" (eat other people's food on Pesach). The Maggid told him to check his water barrel and he found there a piece of floating chometz. It is important to point out that this is not the kind of oppositon to chumros that one sometimes finds in the "modern" sector. The argument here is for the authority of traditional minhagim, not their dismissal as not somehow relevant to our 21st centruy lives. What the Squarer Rebbe says is that raditional chumros are to be mantained but new ones should not be manufactured by individuals. I end with a quote from Shelah, Beis Chochma, vol1. We find that as generations unfold more and more halachic stringencies are enacted. During days of Moshe Rabbeinu only those prohibitions that were explicitly received on Sinai were proscribed. Moshe Rabbeinu enacted a nubmer of stringencies based on his perception of the spiritual needs of the nation. In later generations, be it at the time of the prophets or the Tannaim, the prevailing spiritual leadership instituted additional halachic stringencies and guidelines. Mysticism and Madness, which analyzes several key issues in Nahman’s thinking, is largely a rejoinder to several scholarly works that have, until now, been considered definitive in describing R. Nahman’s religious world. Mark, who is very much at home in the vast corpus of both Nahman’s own writing and that of subsequent generations of Bratslav literature, presents a radically different understanding of Nahman, one that moves him closer to the kabbalistic-hassidic milieu in which he was raised (he was the great-grandson of the Ba’al Shem Tov, who was the first hassidic leader), and returns him from the radical existentialist mode into which some of his earlier interpreters had thrust him. The late Joseph Weiss, in his pioneering Hebrew studies of Nahman, emphasized his personal life (of which we are blessed with abundant material from internal Bratslav sources) and existentialist crises, downplaying the mystical elements in his life and teachings. Weiss was followed by Prof. Arthur Green, who, in his classic work Tormented Master, portrayed Nahman as a deeply conflicted individual who was blessed not only with a powerful self-awareness of his status as a tzaddik, but also with tremendous self-doubt and conflicts regarding his own faith and religious tensions. Green presented this existential portrait of Nahman as largely overriding the more mystical aspirations of the more typical hassidic rebbe, which may be subsumed under the general rubric of seeking a more intense personal and spiritual experience of God. Mark argues forcefully that Weiss, Green and those who followed them misinterpreted key passages in Nahman’s writings, consistently overlooking their obviously mystical meaning and reinterpreting them through the prism of the existentialist lens through which they wrote. While not denying Nahman’s existential struggle, his theological radicalism or his sometimes bizarre behavior, Mark uses close philological analysis to convincingly demonstrate that despite his uniqueness in the world of hassidic thought, in the last analysis, Nahman’s major concern remains that of his other hassidic colleagues, finding a path to God for himself and for his followers. Mark achieves his goals through analysis of issues such as Nahman’s approach to imagination, prophecy, faith, silence, music and the Land of Israel, to which he traveled at the beginning of the 19th century. A precious Talmid Chacham asked me this Shabbos about the meaning behind the fact that Batya, daughter of Pharoh married Caleb (Chronicles 4:18). That set me to thinking and this is what I thought up. As is known, Moshe represents Daas, and through it, the Torah. A recent author (see the file below) suggests, based on and extending the writings of Tsemach Tsedek, that Batya represents "chochmos hahitsoniyos), secular wisdoms. With the birth of Moshe, she descended and immersed in the Nile, purifying herself from the impurities of her father's house (Sotah 12b, see in Gutnick Chumash that washing in the Nile was "mevatel" its idolatrous nature and made it possible for Moshe to be placed into it). Later Moshe marrried Tsipporah, the daughter of Yisro, who explored all wordly wisdoms (it is in regard to this that Tsemach Tsedek points ou that this was a marriage of wordly and divine wisdoms) . I add that according to Midrash Talpiyos, in the name of Zohar, Batya was the twin sister of Tsipporah. Batya then represents the wordly wisdoms which was a midwife for the Torah to emerge from the womb-waters of idolatry into the world. In it she was assisted by Miriam, who represents the spiritual inheritance of Levi and the patriarchs. According to Chazal (Sotah ibid) Kalev also married Miriam. From here it is but a short stop to suggesting that Calev married both Miriam and Batya, as Talmud states there in Sotah regarding Miriam, "lshem Shomaim", for the sake of Heaven alone, in order to unify all the wisdoms within the power of Yehuda, the expression and manifestation of the power of Kngship. This is the file of what the choshuve R. Raphael Y. Rosenman an erudite Breslev Chossid and author wrote on this topic in his Sefer Taam Pesach. A reader asked me to comment on the Na Nach phenomenon. He writes: "I would appreciate a post on Breslaw in general. In particular I often wonder why R Nachman's thought which seems often so appealing to the modern mind (eg treatment of faith and doubt, or writing pretty good pieces of romantic literature) does not seem part of mainstream chassidus - why not? and does that mean it is sui generis (in which case did he just make it up himself?)" I am hardly an expert but I am happy to share the little that I know, ... and may the commenters correct my errors. To me, Na Nachniks are a positive development; in fact, they demonstrate the vitality and potential of Yiddishkeit in general and Chassidus in particular to conquer all cultural obstacles. To understand what I mean, let us take a step back to the origins of Chassidism. The Beshtian revolution was not only a harbinger of modernity; it was a thoroughly modern movement. Until it, a man was bound and saw himself as a part of a collective, bound by the minhagim of where he lived, following the norms and beliefs that surrounded him, and within an authoritarian, rigid communal framework of his kehillah, parnasim and rabbis. After Besht, a man sought his own teacher and fellowship - in other words, the individual became religiously autonomous, choosing which group to follow and how to express his own religious life. Like the Romantic revolution that was yet to come, chassidim elevated and honored emotion and feeling, individual destiny, and supernatural, not human manifestations. In a way, the chassidic revolution was reaching even beyond the surrounding intellectual climate that was becoming hopelessly mired in rationality. The world around it was preparing for modernity, the advent of scientific and critical thought, the dethroning of kings and monarchs and the development of democracies and mass totalitarian movements. It was learning the language of rationalism, individualism and skepticism. Chassidus, on the other hand, was already looking forward to post-modernism. What defines post-modernism? It is the loss of the certainty about the Truth, substitution of the emotion, feeling, personal subjectivity, and existential self-absrbtion for reflection and thought, entrancement with the self insead of a focus on God and World, and the abandonment of traditional definitions and imbuing of traditional terms with new meanings. When we look out in todays' world, we encounter the primacy of this view over the vestiges of the old worldview, as it dies out. In fact, many of our problems as a people are due directly to the fact that many of us no longer speak the "old" language. From inarticulate teen-agers who really can't explain why Judaism no longer speaks to them, to the "kalte Yidden" who go through the motions of religious rites without connecting with them, many around us no longer relate to the concepts of duty, responisbility, revelation, and redemption that are at the heart of Judaism as we used to know it. Their languge is image, feeling. emotion, video, song, music. The pseudo-Kabbala is an attempt to reformulate Jewish values into the post-modern language. It is no secret why Carlebach, Chabad and Breslov are fluorishing.They is the movements that employ image, feeling and song that are suceeding and gaining adherents. So many people today are looking desprately for a way to express eternal truths of the Torah in the current language of postmodernist sensibility. They want a translation into their tongue so it engages their heart. The same thing was taking place in the 19th century. Then also, there was desperate search for the language in which Torah could be reformulated and made intelligible. From extreme reformers to the most ardent isolationists, everyone, everyone, was trying to solve the problem. Some, like R.Shimshon Raphael Hirsch successfully tackled the challenge and put forth Torah-trueJudaism that that spoke the universal language of the 19th century. Others chose reinterpretation rather than translation as their method, a fatal error, with the consequences of which we still living with today This is again taking place now. Some are adapting Kabbalistic imagery and mystical feeling and self-absorbtion to express eternal Judaic truths, and others are producing ersatz-kabbala, hermetic mongrelizations, that stand in the same relationship to Torah Judiasm as the critical-historic method stood in regard to Talmud Torah. The Na Nachs are engaged in a bold and potentially crucial experiment. They are translating Faith into a post-modern cultural language. They are showing the way for the rest of us to follow, so we do not, chas veshalom, dissolve into irrelevance. They are restating Breslav in a redemptive framework. What worries me is their lack of leadership. Messianic endeavors are inherently dangerous. Nathan of Gaza pointed out the the gematria of "nachash" and "moshiach" is the same. Without the kind of leadership and informal controls that existed in the emerging Chassidic world, it is so easy to stray from redeeming the permitted into attempting to uplift the forbidden. R. Yosef Della Reina is still roaming some demonic wilderness into which his daring and failed attempt to redeem the unredeemable has thrust him. In his Megillas Setarim ( there is some debate whether it is an authentic document). Rebbe Nachman protrayed a Moschiach who converts the world to Divine Service though his music and his powers of healing. Rebbe Nachman had foreseen the world in which we live today. I do not doubt that a part of the task would be restating the Torah in all seventy languages, "to turn all nations in a clear speech, to all call in the name of Hashem (Zephania 7:15) '- the cultural language of today. Na Nachs are a part of a revolution in expression and are leading a messianic effort, the redemption of 'feeling' ... and they know it. This is a group that should be closely watched as it shatters the kelippos of the old and comes up with the kernels, may Hashem keep them from stumbling in this holy task. Two messianic traditions - at once. Who said that you can't dance at two Chasunos? At Meron all things are possible. Krekhtsing as a spiritual act.. I) See how precious are the groans (called krekhts) of the Jewish person, for it is the fulness of the lacks. For by means of breath, which is the spirit of life, the world was created, as is written, “and with the breath of His mouth [He made] all their host” [Ps 33:6]. And the renewal of the world will also be by means of breath, as is written, “You send forth Your breath [or: Spirit], and they are created; You renew the face of the earth” [Ps 104:30]. And it is also the vitality of a person, for the life of a person is in his breath, as is written, “and he breathed into his nostrils the breath of life” [Gen 2:7]; and it is written, “all which had the breath of life in their nostrils” [Gen 6:17]. And as the wise men wrote, if breath is absent, than life is lacking. 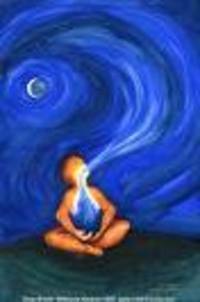 We find, that the main vitality of all things comes from the aspect of breath. And when there is a lack in some thing, the main lack is in the aspect of life of that thing, which is the aspect of the living spirit of that thing, for the breath/spirit is that which sustains that thing. And the groan is the extension of breath, and that is the aspect of “long suffering” [erekh apayim]—that is, that he extends His [his] spirit. Therefore, when a person moans due to a certain lack and draws out his breath, he extends the breath of life to that lack. For the essence of the lack is the removal of the spirit of life. Therefore, by means of the groan, he completes that which is lacking.